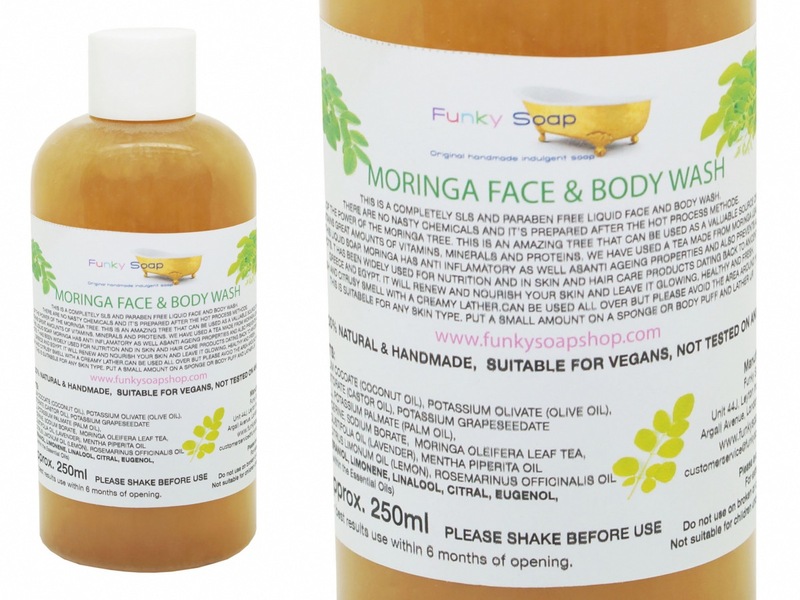 THIS IS A COMPLETELY SLS AND PARABEN FREE LIQUID FACE AND BODY WASH. THERE ARE NO NASTY CHEMICALS AND IT’S PREPARED AFTER THE HOT PROCESS METHOD. 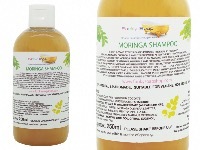 IT IS FULL OF THE POWER OF THE MORINGA TREE. THIS IS AN AMAZING TREE THAT CAN BE USED AS A VALUABLE SOURCE OF NUTRITION AS IT CONTAINS GREAT AMOUNTS OF VITAMINS, MINERALS AND PROTEINS. 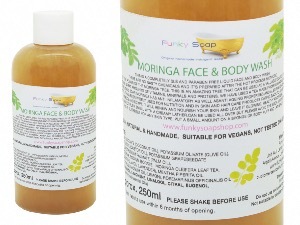 WE HAVE USED A TEA MADE FROM MORINGA LEAFES AS A BASE OF THIS LIQUID SOAP. 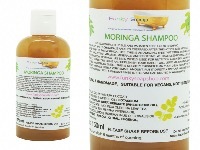 MORINGA HAS ANTI INFLAMMATORY AND ANTI AGEING PROPERTIES AS WELL AS PREVENTING ACNE AND DARK SPOTS. 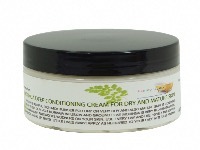 IT HAS BEEN WIDELY USED FOR NUTRITION IN SKIN AND HAIR CARE PRODUCTS DATING BACK TO ANCIENT ROME, GREECE AND EGYPT. IT WILL RENEW AND NOURISH YOUR SKIN LEAVING IT GLOWING, HEALTHY AND FRESH. THE PRODUCT HAS A FRESH AND CITRUSY SMELL WITH A CREAMY LATHER.CAN BE USED ALL OVER BUT PLEASE AVOID THE AREA AROUND YOUR EYES. THIS IS SUITABLE FOR ANY SKIN TYPE. PUT A SMALL AMOUNT ON A SPONGE OR BODY PUFF AND LATHER UP. PLEASE KEEP OUT OF EYES! PLEASE SHAKE BEFORE USE! THESE SOAPS ARE 100% NATURAL AND HANDMADE IN SMALL BATCHES.SHAPE, COLOUR, SCENT, SIZE AND APPEARANCE CAN VARY SLIGHTLY BETWEEN BATCHES AND IT IS IN THE NATURE OF THIS PRODUCT.AS THEY ARE ALL NATURAL SCENTS THEY MIGHT NOT BE AS STRONG OR DEVELOP WHEN IN USE. È fresco e delicato,rispetta la mia pelle. Although I have bought from the website in the past it has always been solid soap bars. This is the first I've bought liquid face and body wash. I underestimated how runny a consistency it was and so the first few times I used it much more than I required was released from the bottle and wasted. This was very disappointing. I like the product in all other respects but feel I'm unlikely to order again sadly just due to the consistency of it.